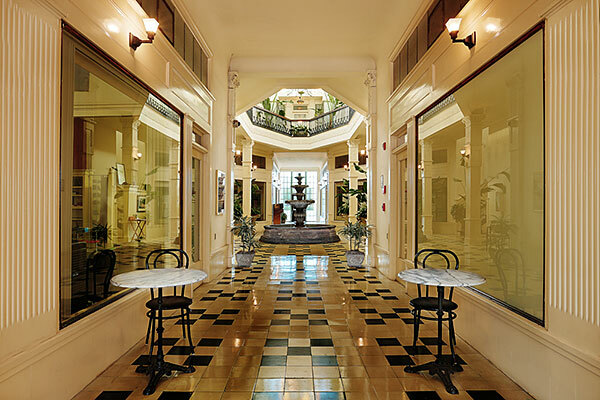 The Arcade Building is the ideal workplace. Its convenient location and abundant amenities cannot be bested, nor can its serene and peaceful atmosphere. Every suite has unique and valuable features, turning each into a personal vacation spot right in your office! To learn more about leasing an office space, contact us today. Take the Harbor Freeway (110) South to its end. Turn left onto Gaffey and continue South to 6th Street. Turn left (East) onto 6th Street and cross Pacific Avenue. The Arcade Building is 1/2 block past Pacific Avenue, on your right. Take the San Diego Freeway (405) North, the Artesia Freeway (91) East, or the Century Freeway (105) East to the Harbor Freeway (110) South to its end. Turn left onto Gaffey and continue South to 6th Street. Turn left (East) onto 6th Street and cross Pacific Avenue. The Arcade Building is 1/2 block past Pacific Avenue, on your right. Take the 47 Freeway West, across the Vincent Thomas Bridge. Look for the Harbor Blvd. off ramp coming off the bridge. Turn right at the bottom of the Harbor Blvd. ramp and proceed South to 6th Street. Turn right onto 6th Street and go 3 1/2 blocks to the Arcade Building (on your left). Please use this form to send us a message. We would be happy to hear your feedback!